“I think that people just really enjoy their experience here,” says Tara Sobey, modestly explaining why she has received so many votes for Best Server. “We’re a pretty friendly neighbourhood pub. 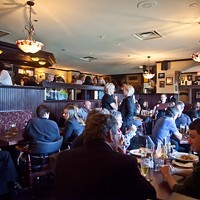 Happy smiles.” This is the second time in a row Finbar’s has won for Best Crew. The atmosphere at Finbar’s is very community-minded, given that they are VLT-free and have their own cycling club. “When you’ve got a really great return clientele, you’re doing something right,” says Sobey.